One of my favorite parts about this t-shirt is how unbelievably soft it is. You know when you have your favorite t-shirt that's been washed a million times and is most likely fading or has a random hole or two but you just can't bring yourself to part with it? Yeah, this t-shirt is that soft. For this outfit I wanted to have a little fun with just a t-shirt and jean shorts so I decided to pair it with a pair of my favorite booties. I love that transition from summer to fall when you can mix pieces from the two seasons! Even though it's still ridiculously hot here in Florida and fall won't start for us until around November I still like to pretend it's fall. Rather than glam-ing it up with a bunch of fun jewelry I decided to add a bold red lip to this look. I mean, what goes better with leopard than red lips? I love leopard too! I recently wore it on my outfit on my blog, but those shorts are pretty! You can NEVER go wrong with leopard!! Those booties are SO fun!! I love this whole look!! You never can go wrong with leopard - it's considered a neutral in my book! I absolutely love that hat, too. Lovely hat! Nice end of summer look. hot damn woman. you look amazing ;) when leopard first came out i was like ew, as if. now i love it! it's the perfect neutral haha. loving the booties! LOVE me some leopard! You look fabulous and I love the whole look! So Cute! And those shoes with the Leopard! Your rocking that look girl! Cute top and shorts combo! 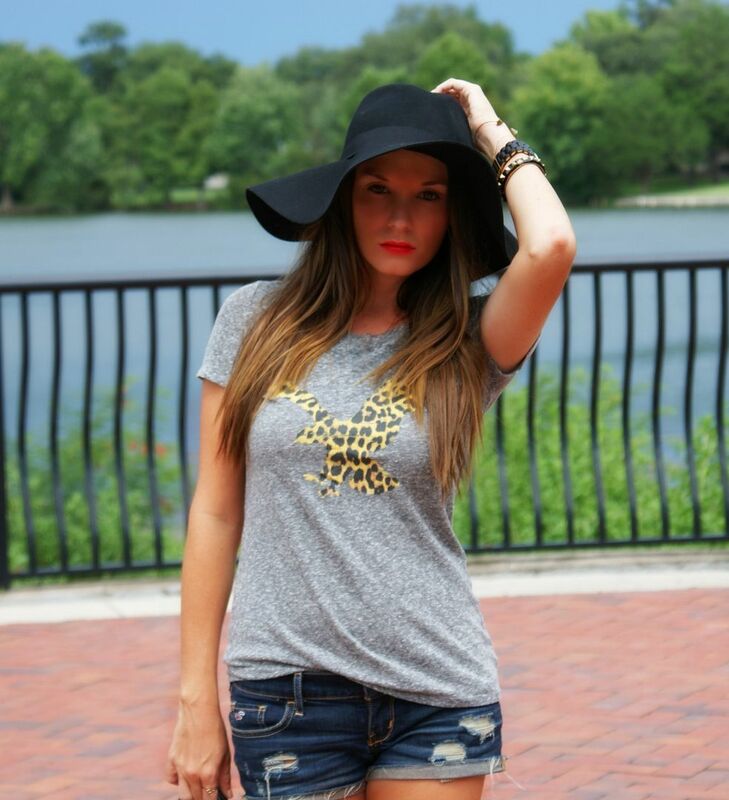 I'm loving the leopard detail on that tee! Leopard is always a good idea!! Love that shirt super cute! I love this outfit- and the hat makes it so complete! Great blog btw, I love the chevron and the header. I'm so with you on that! There really is nothing better than an outfit that is super cute AND comfy. :) Exactly why I live in maxi dresses whenever I can haha. Love the hat! You look amazing! i like the t-shirt & the leopard + gray too! i need to check out AE! Leopard is always a winner - but girl, that hat is also perfection! Love it. You are the cutest! And I am totally obsessed with that hat! As far as I'm concerned, Leopard is a neutral! What lipstick color are you wearing? I'm in love! LOVE shorts paired with booties! What a fun and edgy look! ...No, you can never go wrong with leopard. Ever. And I will buy everything I can get my hands on in this pattern ha. Dang girl......this is a hot post! I saw this top on your instagram and loved it!! The hat makes the whole look come together! Oh such a cute t-shirt! I'm all for casual and cute! You look gorgeous in these pictures, Pamela! Leopard IS always a good idea! You are so wise :) Love this casual cute look! You can most definitely never go wrong with leopard :) Love it paired with the red lip, perfect weekend look! I agree! You can never go wrong with leopard (or any animal print!) AND... those shoes are killer! LOVE them! Loving the transition into fall ahead of the weather idea! I'm doing the same thing here in Louisiana! That hat turns up the glam-o-meter on this look easily! What a great way to transition into fall! You really can't go wrong with leopard! This is probably my favorite outfit on you to-date! Love the casual combo with those shoes!!!! And those LEGS... GIMME! Love the leopard! I can't get enough of it either!